If you are reluctant to flash your pearly whites because of a missing tooth, schedule an appointment with your dentist who will be able to determine if you are a good candidate for Dental Implants. Tooth replacements are certainly not new; in fact, they can be traced back thousands of years with archaeologists discovering skulls with implanted seashells, gemstones, and even animal teeth. Thankfully, because of today’s dental restoration techniques, you do not have to resort to seashells or gemstones to replace missing teeth. Although modern dentistry has improved, there are still millions of people in the United States who suffer from tooth loss. This occurs because of injury, periodontal disease, and tooth decay. Before Dental Implants, people with missing teeth had to resort to dentures and bridges. Dental Implants will provide you with a strong and permanent foundation for removable or fixed custom-made teeth matched to your natural teeth literally replacing the roots of your teeth. There are several advantages including improved speech. If your dentures do not fit correctly, your teeth will slip causing you to slur or mumble when you talk. Because Dental Implants actually fuse to your jawbone, they are permanent and will look and feel just like your natural teeth. Permanent tooth replacements improve your self-esteem making you look and feel better boosting your self-confidence. Another advantage is the ability to eat and enjoy your food again. Sliding dentures make chewing nearly impossible. Permanent replacements function like your own natural teeth allowing you to eat an apple or tuck into a nice juicy steak without worrying about leaving your teeth behind. Tooth supported bridges require a reduction of the surrounding teeth. With permanent replacement teeth, there is no need to alter your nearby teeth in order to support your implants. With more of your teeth intact, your long-term oral health is improved. 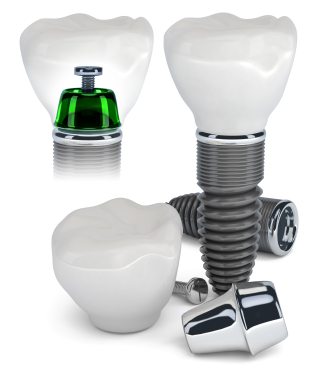 Dental Implants are extremely durable and can last for years. In fact, the first woman who had hers placed back in 1965 still had them intact when she recently passed away. With good oral hygiene and regular checkups with your dentist, they can last for the rest of your life. For more information, schedule an appointment with your Jenkintown dentist who will be able to determine if you are a good candidate for Dental Implants.